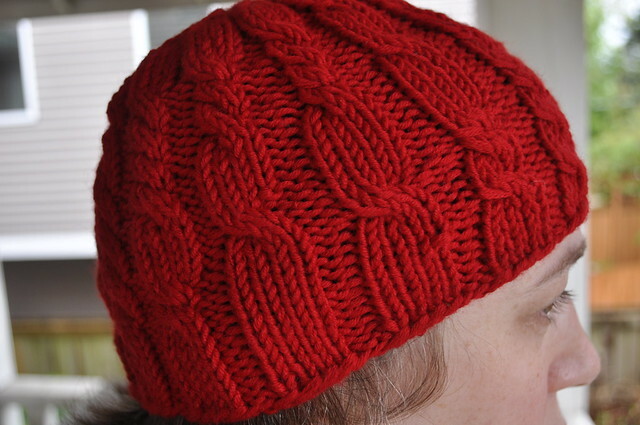 Notes: A fellow Purlygirl created a hat based on Lee Meredith's Game Knitting using the Doubleknit podcast. She explained her "rules" here. I decided to create a hat while doing karaoke. I started with 4 x 2 ribbing then I turned a cabled every time a) a new song started, b)the word "baby" was in the lyrics c) a girl in a bikini was in the karaoke video or d) a song started that I had never heard of. I think the resulting pattern is random but still orderly and therefore pleasing. This was lots of fun to do. Oh, I like it! And so much better than a drinking game... esp for those of us who don't drink... or for those who don't drink while knitting. I foresee introducing this into some of my own future improvised knits. Thanks for the inspiration. As someone incapable of doing anything "random" without excessive planning in advance... I think this is terrific. Very cool.